Americans for Legal Immigration PAC is calling on President Donald Trump and acting Immigration and Customs Enforcement (ICE) director Thomas Homan to immediately arrest and deport illegal immigrant Lizbeth Mateo who has recently been appointed to a statewide position by Democrats in California. 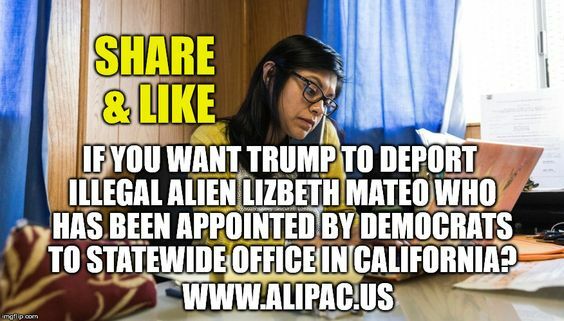 ALIPAC believes Lizbeth Mateo's overt defiance of existing US immigration laws sends a powerful message to the world that America has no control over our borders and our existing laws and elections are meaningless compared to the actual immigration policies in the USA. "People all around the world are reading [about] this and [saying to themselves] America's laws and America's borders and America's citizens are all a joke – so we don't have to worry about anything. We can just walk into the United States of America where there is no fear whatsoever of immigration law enforcement." ALIPAC told One News Now on March 20, 2018. ICE and the U.S. DOJ should also file charges against State Senate President Pro Tempore Kevin de León (D-Los Angeles), who appointed Mateo to the the Student Opportunity and Access Program Project Grant Advisory Committee, and all other individuals who are harboring, assisting, and promoting Mateo in clear defiance of numerous federal laws that prohibit such actions. Having recently viewed the disturbing video of an illegal immigrant family easily entering the U.S. (VIEW HERE) in front of Trump's useless border wall prototypes and then being directed by a Border Patrol agent to the nearest office where the illegals can receive assistance on their illegal journey into the USA, William Gheen of ALIPAC had this to say. In the United States, the American public is supposed to be in control of America's policies and destiny through our elections and the resulting votes and legislation passed by Congress. The American Congress has already passed laws which say almost all illegal immigrants are to be deported or made to return to their home nations on their own accord, employers that hire illegals are to be fined or jailed, and anyone who encourages illegals to enter or remain in the U.S. unlawfully are to be fined and jailed. Unfortunately, Constitutional governance and the Rule of Law are no longer in effect in America and our national policies appear to be controlled by some non-constitutional powers that have more influence over the Executive Branch of the U.S. government than Congress, existing laws, or the American public. No matter how many thousands of Americans are raped, robbed, or murdered by illegals each year, how many millions of jobs are lost or billions in wages depreciated, nor how many hundreds of billions of taxpayer resources are stolen by illegals, American citizens remain unable to regain control of our nation due to the influence of the Deep State and lying politicians who have no regard for their oaths of office. 1. Share this press release and the social media meme far and wide by e-mail and social media sites. Last edited by ALIPAC; 03-21-2018 at 01:55 PM. Deport her AND her illegal alien parents!!! The whole family tree needs to be deported! jtdc and southBronx like this. Trump is no better than Obama in handling illegal immigration, and is in fact worse, because many let him get away with stuff because he is supposed to be conservative. Republicans would be raising h*ll if this was Obama acting in this way! This Kevin de Leon person (real name Kevin Alexander Leon) is currently running for U.S. Senate. Notice how the name he uses sounds more foreign. I find him disgusting. I'm trying to find out how much Lizbeth Mateo is paid for her position on the Student Opportunity and Access Program Project Grant Advisory Committee and exactly who, or what, pays her. So far I have only found some info that it's a volunteer position and not a paid job. If anyone can locate more info please share it with us. ALIPAC, Beezer and southBronx like this. How much plainer can the worthless Representatives make it that they do not intend to do anything we want about illegal immigration? Trump is just as bad as the Democrats. He is all talk and no action! I heard on television that she will be "reimbursed" for travel expenses, costs incurred, etc. So, in effect, she will be paid. Those expenses should show up on the States accounting records for those reimbursements! Deport her and her illegal parents. Audit the States office records and FIRE the person who hired her! Last edited by Beezer; 03-21-2018 at 04:15 PM.
. . . Audit the States office records and FIRE the person who hired her! She was appointed to the unpaid volunteer position by CA. Senate President Pro Tempore Kevin de León (D-Los Angeles) De León is unable to run for re-election in 2018 to the California State Senate because of term limits.